In recent years GIS and web technologies have advanced to allow the sharing of geospatial data on the web. Government agencies, corporations, and organizations sometimes have a need to simply post GIS datasets on the web and donà¡¬ways require advanced GIS modeling capabilities. There are many products available to serve geospatial datasets on the web, but they often have a complicated setup, costly license fees, and provide more capabilities than are needed. The web mapping system we have built is an inexpensive and simple solution to allow posting and sharing of GIS data on the web using open source map servers deployed on a virtual cloud server, and an open source thin GIS client running in a web browser. The map client was developed for the US Forest Service and is available for free. It provides standard map navigation capabilities, a layer list, scale bar, legend, and more. Tools are provided at no cost to add new layers to the map using publicly available OGC compliant web map services. Because the web mapping system uses only open source GIS software, once your web map is set up, the only costs are from Amazon Web Services to host the virtual web server. Serving your map data on the Amazon cloud provides additional benefits besides low cost. A virtual server on the cloud requires no up front purchase of hardware and software that would be required for setting up your own server. Amazon charges only monthly and requires no annual commitment. 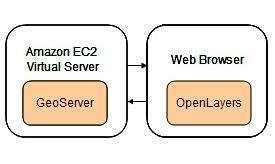 This makes the cloud an ideal environment for testing and development of a web map server. Your business or organization can now try out web mapping for little cost to see if it meets your needs. Please contact us for more information on creating a web map. In addition to custom web maps development, Kingbird Software provides preconfigured web map services using the system described above. See our description on web maps for more information. Kingbird Software has tools for users to upload their own GIS data and set up web map services using GeoServer hosted on an Amazon EC2 instance. Currently, the user uploads their data and specifies how the layers should be set up. Kingbird Software will set up the layers on the server for the user. These tools are being enhanced to eventually allow the user to set up the layers on their own. There are many open source map servers available that could be used with the system described above. Kingbird Software has been using GeoServer for the map server in this system, but will support other map servers at your request. GeoServer is built with the Java programming language and is maintained by a diverse group of individuals and organizations from around the world. GeoServer is the reference implementation of the Open Geospatial Consortium (OGC) Web Feature Service (WFS) and Web Coverage Service (WCS) standards, as well as a high performance certified compliant Web Map Service (WMS). GeoServer is an OGC compliant WMS server with support for multiple data sources and the style layer descriptor format. A feasibility study was conducted to determine the usefulness of GeoServer for deploying map data on the web with a cloud server. This study has indicated that GeoServer is capable of serving map data fast, efficient and inexpensively on a cloud server. 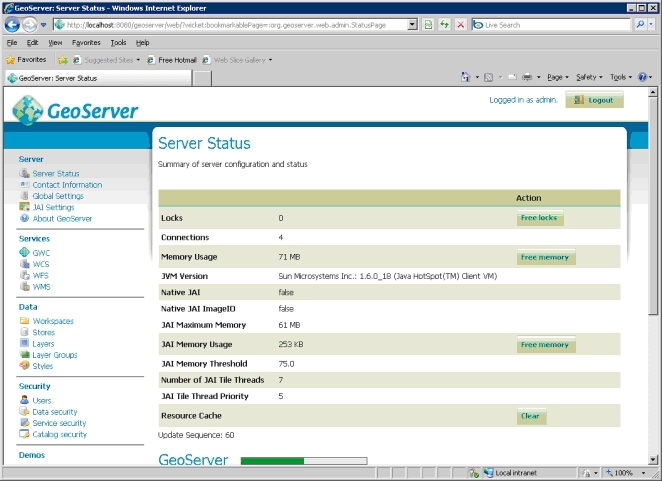 GeoServer provides a web based administration tool that controls all aspects of map server and layer configuration. Web map services serve georeferenced map images in jpeg, png, or gif formats. These images are downloaded in the web browser for each map layer and compiled into a single composite image by the map client software. GeoWebCache is integrated with GeoServer and provides a mechanism to cache map tiles for future use. This avoids the need to generate the images anew for each map request. A tile cache significantly improves performance of a map server. GeoWebCache is preconfigured to cache tiles as they are created if the tile does not already exist in the cache. In addition, an interface is provided for seeding the tile cache in advance to improve performance.